Front-load washing machines are notorious for collecting mold. I’ve had my front-loading washing machine for about four years, and it has some great advantages – it’s quiet, fast, uses less water and detergent, and gently tumbles (rather than yanking) my clothes. In general, I’ve been so pleased with it that I was shocked one day when I opened the door and was nearly knocked unconscious by a fetid blast of moldy-smelling air! How could a machine that’s so wonderful, suddenly turn so horribly smelly? The answer is in the way the machine is designed. 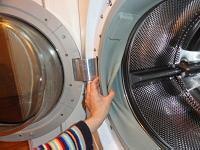 Front-loading washing machines have watertight, airtight doors that seal with a rubber gasket. That rubber seal traps moisture in the machine and also provides the perfect nooks and crannies for mold and mildew to grow. Top-loading washing machines, on the other hand, have a rather loose fitting metal door that easily allows the tank to dry out between loads. The problem isn’t helped by our laundry preferences. High sudsing detergents and liquid fabric softeners leave behind residues and films that invite mold growth. Cold-water cycles and mild, eco-friendly detergents don’t quite blast away residues like their environmentally-unfriendly counterparts. So, to keep mold at bay, front-load washers need just a bit more maintenance than top-loading machines. Clean Dispensers: Remove the detergent dispensers and give them a good scrubbing. If they don’t come out, clean them as best you can, using a bottle or pipe cleaner to reach back into the crevices. 1/2 cup of powdered enzymatic dishwasher detergent (such as Cascade Complete). 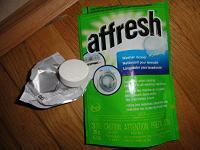 A commercial residue-busting washer cleaner (such as Affresh or Smelly Washer). Repeat Cleaning Cycle: If the problem persists, repeat the cleaning cycle and consider trying a different additive. It might take several cycles to get the smell out. After going through the posts and watching few YouTube videos, I removed the rubber seal (took about 10 minutes with 2 screwdrivers) from my whirlpool washer. Submerged the seal in a bucket with 50:50 bleach; water overnight. Nasty mold was gone completely. No black marks either. Placed seal back in … took about 20 minutes. Then ran a bleach only clean cycle. Looking good. 2. Cleaned Soap Dispenser with Vinegar soaked cloth – Especially Roof and dispensing channel. Removed and cleaned Dispensing Tray. 3. Ran HOT water cycle on “Heavy Load” with NO Spin. This removed ALL (current) odors. 2. Leave door open/ajar at all times. Maintain the open position by inserting Rubber wedges at Hinge. 3 . Use Vinegar as “softner” moving forward. IF the odor returns, I will remove the “agitator bars” of the drum and clean any mold accumulation exposed here. NOTE: I am still suspect of Mold behind the drum and elsewhere in the machine. My expectation is that this mold in invisible places (behind drum and in the systems) will be controlled/suppressed by regular use of Vinegar as the Softener. We will also be using LESS HE detergent and probably change to powder he DETERGENT ADMINISTERED in THE DRUM as I suspect much problem begins IN THE CHANNEL from the dispenser to the drum. But, right now: NO ODOR!! I have a Whirlpool Front Loader. I always leave the door open and the black mold cannot be removed. Tried everything the internet and the manufacture recommended and nothing worked. For $500.00 I can buy a top loader and that’s what I will do. Front-Load Washing Machine are great idea to save water and for cleaning the laundry. There needs to be a recall on all of these front loading machines. . They are a danger to our health. Who ever approved this design? Thanks to all for their suggestions. I had mold on the gasket of our front loader Bosch . As suggested I used the paper towels soaked in bleach and let them sit on the affected areas for about 6 hours. 99% of the mold appears to be gone. Afterwards I ran an empty load on the highest temp available with detergent and all looks good to go. Thanks all. I agree with JeffFrank. I have tried everything except a pressure washer to clean my rubber gasket. There is nothing you can do when mold gets on it. No more front load washers for me either. A HUGE shout out goes to Paul, who mentioned removing the screws to the pieces that holds the agitator balls inside the drum, WOW!!! After cleaning the rubber gasket…etc after using the machine, I still could get whiff of that nasty smell. One day while searching online , I stumbled upon this thread & found the solution that Paul suggested. First, it might be a good idea to change the heading of this section from “How to Get Rid of Mold and Smells in Top-Load Washers;” to read “….. Front-Load”! — Secondly, thanks for the advice, but I think I’ll just get rid of the front-load, buy a cheap top-load. I’ll have to figure out how to put the dryer out on the porch, but there is just no way to demold the inside of the feed pipes behind the “detergent fill” drawer! Impossible to reach. I noticed something stuck under one of the agitator/roller things and realized I could unscrew 1 screw and slide it off!!! Holy disgusting!!!! Muck! Algae looking grossness caked under all of them!!!! After bleaching them, spraying the funk off of what was on the plastic part in the tub, and running a tub clean without them on, I’m hoping that I’ve cleaned off what seemed like a lifetime of dirt and disgust!!!!! The advise does not work. I have an LG washing machine and I will never purchase a front loader again. The mold buildup is disgusting and not preventable. The water pump does not remove all of the water from the bottom of the machine… so if you don’t remove the water before you first set of loads for the day they smell. I have followed ALL of the advice, wipe the gasket, keep the door open, Afresh wipes and cleaner, bleaching the drum… nothing works. I had a top loader for 15 years and never had to perform any upkeep and never had problems. I could care less if I use a few gallons more water or detergent. Take the advise and stay away from front loaders and especially LG. Thanks for sharing your experience with the TodaysHomeowner.com community, Beverly! After battling toxic mold poisoning from mold building up in our crawl space from an unseen leaking gutter pipe, we became the most mold-savvy people on the planet. First to go was our front -load machine, folks! They may look cool and be the rage, and are the only style used in Europe, BUT after finding all the hidden mold behind the drum, in the gasket and in behind the fill cups, we went back to the good, clean, old-fashioned top loader where all WATER DRAINS OUT rather than SITS AND BECOMES MOLDY! Front loaders are the highest maintenance machines on the US market. After almost losing my life to mold spores, I would never use a front load machine again. Since no one has replied to the gunk being flung onto clothes in the washer, I’ll address it. It’s coming from the 3 agitator/rollers or whatever they’re called in a front loader. You detach them from the drum, usually just a few screws, and clean out all the tons of mold and gunk that will have accumulated inside them as well as their attachment points on the drum. If you’ve never done it before, it will be a eureka moment….guarantee it. 	After each wash (unless you’re going to wash another load immediately), take 2 seconds to tuck a rag into the bottom of the rubber gasket to wick out the water that pools there. 	Remove the rag when you take your clothes out of the dryer. This allows the rubber gasket to dry out completely. Hang the rag to dry somewhere nearby. 	Leave the washer door open when not in use, so that all of the interior can dry out. My mother started homemaking with a Westinghouse front loader in 1950, I married in 1965 and got a White Westinghouse front loader….2 kids and all the barn clothes imaginable…it lasted until 1988, I bought another……NEVER NEVER had any of these problems. By 2011 WW was too much of a good thing, off the market… and I had to get a Bosch….some problems. I only use 1T Tide put in with the clothes, also washing soda, if needed, no clorox at all, 1/4c white vinegar for fabric softener, no dryer sheets. I think WW absconded with all the good patents as no one has made another to even come close. Like everything else, they make ’em to sell, not to last! My 2 1/2 year old front loading LG washer Iverter Direct Drive is one tough workhorse. I have loved it from the get go. Then a year ago I noticed mold forming inside the door gasket. I hadn’t always wipe it out after a wash, I didn’ Leave the door open. The reason mild was forming. I did not and never have had an odor or smell as others do. Leave the door open after wiping the gasket and door dry. We’ve only been here for two weeks so we know this is due to lack of maintenance and care from previous tenants. The maintenance staff came by and tried convince us that we were crazy and this was normal and to basically just live with it. They were adamant we were wrong that there was any mold. I could tell they were just lazy and didn’t want to deal with the issue. We tried everything mentioned in this article and the smell still persists. Funny thing is, this building is only two years old. We lived in a unit in the same building with the same washer and dryer and never had this problem. Am I wrong to demand the building to replace our washer? I feel this is there responsibility and they should be the ones to fix this issue before the tenant moves in… Am I over doing it here? it was still clean but all the black mildew was gone and the rubber in my washer looks brand new! THANK YOU JESUS! Thank you for the good tips. I found your page because the front loader I inherited in my apartment had some mold growth that I was able to remove. 2. ALWAYS ALWAYS leave the washer door ajar if not in use to air it out so mold has no chance to grow. 3. Use hot water or warm water when washing, especially if using fabric softeners. The false and dubious claims by North American detergent manufacturers to only use coldwater is one of the biggest scams in the laundry industry in America. It simply does not work, regardless of what they claim. It simply a marketing gimmick. The amount of energy and water consumption is miniscule in a front loader compared to top loader! But the washing results are superior and incomparable to a top loader. My grandmothers front loader that was built in the 70s and was in use for 30 or more years, a much less modern machine than front loaders nowadays, has never had a problem with smells or molds! Why? Keep your machine open when not in use! In response to Cathy’s comment on November 8, washing by hand is great, if it’s just you and a mate, but is not practical when you have a family. I do it myself though, when traveling. today’s microfibers do not need a machine wash all the time, and dry just by hanging. However, today’s modern machines, like modern cars, require MAINTENANCE, and you wouldn’t expect your car to run like new if you don’t change the oil and filters periodically. I don’t see anything in this article that is particularly onerous in terms of maintenance. So if you prefer the old fashioned way, have a blast, but it isn’t really easier! I have an LG front end washing machine, it’s about 7 years old. Every so often if flings out brown gunk all over my clothes, it getting worse. I’ve cleaned out the gasket, filter and drawer where the detergent etc goes. I’ve also run bleach through the machine using the tub clean cycle. Well….I just washed my sheets and there’s brown gunk flung out all over them, looks like I just mopped the floor with them. Is there someplace else to clean? We also have a water softener. Does anyone know if replacing the front end loader with one of the new top loaders do a better job? Well, I’m off to the laundromat! NEVER buy a front loader again , and NEVER buy an LG appliance again. Wish I could dump it and buy a top loader. LG appliances STINK ! I put in the soap dispenser a few drops of tea tree oil every time I do a wash. It has powerful fungus-killing abilities. If it can kill toe fungus it can kill anything. Cheapest place to get it is Amazon. I spent $770 for LG washing machine. Despite enough care the rubber gasket started growing mold all over. When I called LG they said it would cost $300 plus to install a new gasket! This is totally ridiculous ! Can you expect me to buy anything made by LG?? We had a Gibson front loading washer – 1999-2013 and not once did we have an issue with mold around the gasket. We now have an LG and the level of mold and crud which builds up in it is ridiculous. Washer manufacturers have been able to create front loading washers without this problem. What changed? My Kenmore, purchased approximately 2005, stinks and I will never buy another Kenmore washer. We had it repaired a number of times and had the gasket replaced and the machine cleaned. The mold smell is now overpowering and causing me to get Asthma attacks. I have to close off the laundry room so the smell doesn’t enter the house. Can’t afford a new one but when it goes, no more front loaders for us. I am back to tell you that all the flushing and cleaning of the inlet and outlet hoses and draining maintenance all worked. Now I am getting intermittant clean clothing. Sometimes my cloths smell and go not get cleaned. Well the machine is clean and working great. I have discovered it is the water pressure that is too low if I have any faucets, garden hose or dishwasher and even someone in the shower. UREKA! Can’t run anything but the washing machine when washing cloths. Duh didn’t need a rocket scientist! I read the remedies to the smelly clothing. I cleaned the machine in all the areas and used afresh cleaner 3x. Used vinegar. It all worked for a day. Before I was going to throw it out, I decided to have a repair man. The verdict was my machine was as clean as a whistle. Repair man said its a problem with front loaders. After $70 for that information, as a last resort I looked at the manual. Turns out there are inlet hoses on the back the Repair man did not check. Well Eureka! There was black sludge behind the filters that I pulled out. I squirted ammonia and water and flushed it out. Duhh. Simple solution. Homeowner common sense. Not sure why this is not on the LG website as a possible problem. EYES: Causes burns and may result in permanent injury to eyes including blindness. promptly washed off may lead to toxic effects similar to ingestion. Harmful if absorbed through skin. INGESTION: Ingestion can cause gastrointestinal irritation, nausea, vomiting and diarrhea and possibly death. MEDICAL CONDITIONS GENERALLY AGGRAVATED BY EXPOSURE: Pre-existing eye, skin and respiratory disorders. Hi. We have had a front loader for over twelve years. Have some times cleaned black mold out of poweder drawer but never needed to any other area. We have a miele. We have had everything in storage for a little over a year and washing machine was kept closed. The machine stinks. Lots of dlack mold all over grey rubber thing by door. So gross. Can’t imagine what it looks like in the drum area. Or the outside. Is it worth cleaning or just get a new one. The smell is so bad we can’t have the machine in the house. I put 20 drops of pepperment essential oil in the laundry cup with every washload. Then, when the load is finished I place 4 to 5 tennis balls in between the rubber molding and the washer tub to hold the rubber moulding open so it dries between loads. Make sure you leave the door open. You can also put the tennis balls into the wash. The tennis balls pick up hair as an added benefit and help get your clothes cleaner. This works better than any or those supposed “mold killer” ideas and it is a lot easier. The washer always smells like peppermint too. Wow – thanks for all the feedback and extra tips! The mold staining can be really hard to remove, even if you’ve killed the mold itself. Brian Gordon, I have a Samsung front-loader, and when you pull out the detergent tray, there’s a little button on top that you press and then you can remove the tray completely. Then you can scrub the tray in the sink. However, after you get the tray out, look inside the machine to see if there’s mold inside the compartment. That would be harder to clean, but I’d say use a spray bottle of soapy water or bleach cleaner, then a scrub brush or sponge to reach up in there and clean the nooks and crannies. Just wear old clothes – it’s likely to be awkward and drippy. I just called the gas company out to check for a gas leak because the smell was so foul. Luckily, the guy had my same washer and had the same issue. He made sure there were no has leaks and told me about the water that sits in the gasket and starts to get stagnant. In page 46 of my manual I saw a description of how to clean (as you mentioned above) and the recommendation to clean monthly. Shouldn’t this have been in page 1 or on the machine? Glad to see I wasnt the only one that was unaware of the maintenance involved. Also,there is a little house in the front where you can empty out sitting water. Be warned, it smells like a dirty fish tank. My Bosch front loader started to have mold–I think it was because I often used Dawny. I run a couple cycles using Cascade-complete dishwashing powder in the hottest, longest cycle and now it is as good as new. I never used Dawny again, and since the manufacturer advises against using Chlorine, I would say avoid it. I do agree, if you pay for something, it should not have a problem like this.. Let’s face it, these mfg. run by huge Corps. are in it for the money only and all the advertising is for you to THINK THEY care. They dont and it is all about squeezing another penny out of the product to pad the CEO and Boards pocket so they can buy a forth house. You will never again see a product you consider to be REALLY GOOD, where maintenance allows it to work for 25 years… i.e. 1960s washing machine… Get use to the 7 year flip on everything you buy. That is how they want it, design it, and sell it. ! All of these comments sound helpful if you have the offending front-loading washer in your home. Unfortunately, I live in an apartment complex of 4 buildings with the laundry rooms supplied by Coinamatic . Recently the owners have converted ALL their washers and dryers to LG. I am having problems with these dirty streaks on my clothing whenever I’m doing my laundry. These remedies mentioned are not suitable for my case because I’m not prepared to run several cycles at additional cost and do a lot of scrubbing just to be able to have my clothes come out DIRTY instead of CLEAN! If I did decide to try these remedies, I would need to remain in the laundry room through out the whole process because these machines are accessible by all tenents. Chlorine eats through the chromium oxide coating that protects stainless steel very quickly. Once the coating is removed in some parts and not others, galvanic corrosion starts and pittings form. If you want to see how bleach attacks rubber try putting some in a spray bottle. Within half an hour the bottle will no longer pump as the seal has been completely eaten away! Of course the bleach you’re using is diluted, so it won’t kill it immediately just hasten its demise, which is probably why some manufacturers void the warranty if bleach is used. After spending a fair amount of time reading the comments here I took some of the advise to solve the problem I am or was having with my Kenmore front load washing machine. The problem being when I had washed a load of clothes I would have these brown marks on my clothes, but not with every wash. I didn’t have any smell at all with my washer. I left my door open and wiped down the door and seals after every wash. I haven’t looked into whether this is worth the time and trouble — deadline to file a claim is Oct 11 2016 — but do agree it is outrageous that a company can manufacture something with such a defect and then pass on the problem to the consumer! I have a top loader washing machine and could not figure out what the BLACK dirt was when putting the pods in the dispenser drawer. Well reading here I was grossed out and have tried everything to get rid of the mold. Got most of it out but on the top cannot seem to get it all. If you want to remove the smell of mold, the secret is TANG instant breakfast drink or CountryTime Lemonade. Throw 2 cups of powdered TANG or Countrytime Lemonade into the washer. Run on the hottest cycle your machine has. Then do it again if you washer is really bad. Do this once every three months. TANG is cheap. It’s nothing more than high concentrate citric acid. Citric acid will work better than any other cleaner you can buy. I have been doing this for years and have NEVER had a mold or mildew problem. Occasionally I get a spot which I can easily clean. Cleaning the detergent drawer components is great as long as you completely remove the drawer and completely clean both the drawer and the opening itself. (Hint: pull out the drawer and look up and try not to scream.) Remember that mildew spreads by spores, so killing just some of it won’t help much. To get the musty odor from your clothes use vinegar in the same spot of the Clorox. If you wash white clothes then use half Clorox and half vinegar. Use it for every cycle. After the 3rd wash, my clothes never had an odor again. Also want to give another thumbs up to Gene’s comment. I placed the paper towels on the gasket and stuffed the inside with paper towels. Then I soaked it all with bleach. Make sure you pat down the paper towels so that there are no air bubbles between the wet paper towels and the rubber. The TAKEAWAY here folks, is to soak for AT LEAST a day. A couple hours will not cut it all. I closed the front door so the fumes wouldn’t evaporate into the air. Once I removed the paper towels I was amazed that the black mold was gone, even though I had tried scrubbing it with Hydrogen Peroxide and bleach vigorously prior. I have a LG top loader that is about 3-4 years old. Whenever I use the Delicate cycle I get brown guck/mold all over my clothes. I was away for 2 months and the washer was not used. When I started doing laundry, the mold is now HORRIBLE! I have ran it 3 times on Clean Tub and literally vacuumed out the washer and the mold is still coming out everywhere. HELP!! I’ve had an LG front loader for 6 years. Never close the door after use and remove the soap dispenser after each use as well. I recently discovered the second smaller gasket seal. The gunk that was built up in it was awful. Removed my whites today and they were covered in Brown gunk that looked like mud with mold in it. How do you get that out If its under your drum? I can’t afford a new washer or ward robe for entire family. My problem is the soap dispenser drawer. The area that drawer sits in gets black mold even if the drawer is left open. I have successfully cleaned the area and drawer with Tilex, used as if you were cleaning bathroom tiles. Spray it on, wait, then rinse with a hot water spray bottle. It is a pain in the neck but works. Run the washer’s clean cycle to complete the task. I am 60 years old, been washing all my life with many clothes washers and now in the process of buying a new one. But after reading all the cleaning instructions and so on for a Front-load washer I have decided never to buy one. Imagine, if I still had my kids at home and doing 3 or 4 load of wash every day plus the job of cleaning the front load washer every time would go nuts. Why don’t you buy a model with no problem. After I do the laundry, I usually dry out the gaskets and the glass using an old towel. Then I soak a microfiber cloth in rubbing alcohol and wipe the gaskets. I leave the door open for an hour or two for everything to dry out completely. I do this after each cycle, with no exception, because there might be some other than a stray sock. You may find coins too. And we all know what happens with metal when it interacts with water. Washing machine black door mould how to get rid off completely.I got some Cillit Bang mould and mildew remover and left it on doof for three hours did this process three times the black mould is nearly gone! !Had tried bleach that just rids the surface of the mould off! It does say on the bottle do not use on rubber however had no problems with the product on the seal whats over. If u cannot get it looking pristine the seal, google the model name of the washing machine model and u can find the door seal for your door on amazon or spares for you!! I have just used Dettol laundry sanitiser in a load ( no clothes) and it shifted a very large amount of black flat fungas (half a cup full) into the lint basket. I would suggest giving this a try. I spent all day trying different solutions to get the mold off the rubber with no results. The next day I decided to try undiluted bleach on a handiwipe, and put it right on the mold area, and in one hour it was magically gone . Hi ! Have the same problem as everyone else with black mould , smells and marks on washing. However, has anyone thought that the real reason may be the water itself? We lived in a hard water area (GB) for 13 years and had the same Zanussi washer with no sign of any mould etc. We moved home and now have soft water and have had 3 other washers in the last 23 years, my latest one being only a year old and since moving have now got the awful black stuff! Thoughts? Cheers! This additional maintenance is not realistic for busy wives and mothers. Companies should be looking to fix the issue instead of handing out work arounds. If this has turned black and discoloured in the folds or anywhere else don’t waste your time trying to remove / clean the black marks & discolouration from the door rubber, you absolutely won’t do it, but….. as an on-going preventative measure it is really important that you wipe & dry the door rubber every time the machine has finished a wash cycle, especially at the bottom where the water and residue collects. Now let me be clear here, I’m talking about long term staining which has accumulated over a number of years. 5 Vim powder toilet cleaner. 6 Ajax powder toilet cleaner. 7 Washing powder (laundry detergent). 24 Heavy duty industrial degreaser. Yes I really have tried all of the above …………….but without any success whatsoever. This black discolouration is apparently caused by mould which in turn has been caused by dampness being trapped on the rubber. The only way to reliably avoid this, or prevent further staining of the door rubber is every time your machine has finished a wash cycle is to wipe the door rubber dry and above all and most important of all, leave the door open, do not close the door as this will cause the dampness in the machine to instigate the growth of mould…….yes that’s the nasty stuff which causes the black staining on the rubber. I hope this will save you a lot of unnecessary work and wasted effort in trying to clean the black staining from your door rubber, in my experience it is impossible to remove this staining once it has occurred but that’s not to say you really have to go to the expense of changing the door rubber, just remember to wipe the door rubber dry and leave the door open after each cycle and you shouldnt have any ongoing issues, it just doesn’t look very nice…………….but hey, who looks at your door seal anyway apart from you. PS…if anyone has found the magic black mould remover bullet, I would greatly appreciate you letting me into the secret, and no, I havent tried a flame thrower yet !!! I am a contractor and have pulled out and installed many front loaders. They all do not smell but most do. The best situation when you have this type of washer installed is first have water softening equipment installed as well. Next use 1/2 the amount of detergent that you think you should use. Most people believe dirty clothes ,..more detergent. This is wrong and sets the stage for residue build up. Finally ,leave the door open when not in use. If you already have a mold odor, fill a bucket with a few cups of water and a few cups of splash less bleach, soak your rag and clean the folds of the door gasket. Clean the gasket once a month and leave the door open and this problem will be solved. Read your manuals. If you don’t have a manual, get it on-line. Front load washers use less water and require HE laundry detergent. Use less detergent than what the manufacturer of the detergent says as well. They want you to use more so you buy more. Keep the detergent tray open and door wide open after every wash and wipe the gasket off. DO NOT leave clothes in the washer for any amount of time! If you have a lint trap, religiously clean it out every month. Manufacturers are making top-loading machines the same way now (less water and no agitator) and people are having the same issues I see people complaining about here. Simple maintenance will go a long way. We have a Samsung and it is a great machine. I still have to clean it but I believe it is mostly from the liquid detergents and softeners we use. I have been fighting a horrible rash for 10 months. Doctors have no idea. I have changed soaps, gone gluten free, all personal products and have eaten only organic. Noting has worked. After reading this, I checked my front loading LG machine and no mold in the tub, but when I pulled out the drawer where I put HE soap in it was black at the back. I pray that this is my problem. Keep you informed. I just got a used front loader too and am trying to get the mold and smell out too. I noticed on the front inside of the door there is a square hole on the bottom. How do i get the mold out out that compartment? Any advice? Once a month I use cotton swabs to clean the drain holes in the rubber gasket. Usually pink/orange and black mold comes out on them. I also use vinegar instead of fabric softener. Sometimes I add baking soda to my load of towels. Use vinegar in your fabric softener dispenser, it keeps the pipes clean, softens your clothes and keeps the tub clean and no your clothes don’t smell like vinegar. Fabric softener is toxic, google it you’ll never use it again. Also use in place of rinse aid in dishwasher its natural, cheap and works great. Just watched an episode of “The Doctors” where front load washer mold was the topic. If you have asthma or a compromised immune system, this mold,can make you sick. Checked other sites. There are lawsuits against the manufacturers for the health issues they cause. A technician said to check the hose bringing water into the machine. Often black mold grows there first before you even notice an odor. YouTube video on how to take the back and top off to check it out. Above maintenance efforts will work. Open door after each load, only add a small amount of detergent for each load, wipe clean, and clean with bleach or tablets every/every other month. 1) Use a toothbrush with hydrogen peroxide to scrub gasket crevices. We have a large dog so there was a lot of hair and dirt that was stuck in the holes. Water must be able to be drained. Standing water in the gasket helps the mold grow. 2) Add paper towel strips (semi jammed into gasket crevices) and apply hydrogen peroxide to soak the strips. Let sit for 15-30 minutes. 3) Add a quater bag of powder pool shock to the pre-rinse and main cycle trays. Ran sanitizer cycle (hot water and heavy soil – 1 hour and 45 minutes). All stains gone and hopefully all mold killed. –> In the USA the law firm of “Lieff Cabraser” is working to force several manufacturers to repair moldy machines. On my machine I now open the “large object filter” after every load to remove standing water. Glad to read all your comment. I am starting fresh with the installation of a new gasket on my three year old kenmore elite front loader. Mold Is just disgusting , have tried about everything except the peroxide solution. Will proactively try to keep this clean from here on in. $200 later for gasket and installation and hoping it will work. Like everyone else I wiped down the gasket and take out the dispenser draw each time we use the machine, only the two of us at home, so two, possibly three loads a week. If problems arise again with this mold… Front loader out the door, new top loader to take its place. I have stopped using the tray except for white vinegar. I put my detergent directly in the tub and I stopped using fabric softener..the vinegar seems to have stopped the smell. I never saw mold but I always leave the door ajar and wipe down the seal often. I have seen mold in the tray area after I remove the drawer. Thinking the tray is the biggest problem. I read to stop using fabric softener in it so I decided to stop using it altogether and just add the vinegar in the detergent tray to clean it up. Looked at all the current articles, I have a Whirlpool about 6 years old have mold on the rubber gasket but never any odor. Granddaughter asked me if I ever cleaned it, said occasionally. So decided it was time. Used Tuff Stuf and alcohol, got tons of dirt and dog hair out of it. then sprayed it down with scrubbing bubbles with bleach. Mildew stains are still there but all else is nice and clean will propably will put vinegar in my wash loads. I use Tide HE packets and tablet bleach as I can trust my son or granddaughter to put in the right amount. Hope this works. Front loaders never had mold and mildew problems. IT IS A MANUFACTURING PROBLEM!!!!! MANUFACTURES PLEASE GO BACK TO THE DRAWING BOARD AND FIX THIS PROBLEM FOR THE NEW MODELS. I have a Maytag front loader. I have tried bleach to clean off the mold around the rubber seal and all places reachable. The only mold that can be removed is the surface mold. FYI – The mold grows into the rubber and can never be removed. I personally think there is mold under the drum where it is not visible and can never be cleaned. How can running empty cycles with bleach be effective when the bleach gets watered down? It takes my towels 1 use after washing them to start to stink again. I leave the door open after every wash and put a hand towel in the area around the rubber seal where the water puddles. Still the mold grows. The fix – buy a top loader. Hello, where can I buy hydrogen peroxide? It seems to be working better then the bleach option. I have had my front loader for about 6 years. The black mold around the gasket has been a problem for years. I have used small tweezers to remove muck from behind the gasket when I’m done with all my washing (I wash about 4 loads once a week). I have also used paper towel to clean the gasket, door seal and glass, but the mold continued to be a problem. I have been using Weiman Washing Machine Cleaner & Deodorizer for about a year. It did help keep the washer smelling fresh, I also leave the door open after applying the product to air it out. However, the mold on the gasket continues to be a problem. Today I decided to use Tilex Mold and Mildew remover on the gasket. I sprayed it on and used a Mr. Clean magic eraser to clean it and “WALA” the black mold was gone. I ran the washer on a hot extra long cycle to get the cleaner out of the washer. I’m happy with these results and hope that by continuing to clean under the gasket with the tweezers and use the Weiman Washing Machine Cleaner & Deodorizer on a regular basis my machine will stay clean and smell fresh for years to come. I googled this subject and got many answers referring to using turpentine, but it’s it’s hard to get these days. I’m wondering if this will do more harm than good. The instructions were to wipe it down with turps and a paper towel and that it may have to be done more than once. All these have been helpful. After reading the comments, I tried hydrogen peroxide in a “tub clean” cycle and then wiped the rubber gasket for my LG front load. It smells much better. I hope it lasts. My machine had been smelling “sour” and I have never seen or smelled mold. I was, however, using white vinegar with my wash loads. I am in the USA and we don’t seem to have the black mold the others have mentioned. It is interesting that one person mentioned that when no longer using Tide, the smell subsided. I had a more expensive LG front load washer before my current LG front load and never had the smell even though I maybe used the tub clean setting twice the whole time we owned it, and never cleaned the gasket. The first LG we owned began leaking water because the drum had given out after 7 or 9 years. I plan to drain the water on my current LG from the tube by the catch filter in hopes that it will prevent future smells. I, too, miss the top load washer reliability of the past. I chose this LG front load because reviews of current top loads will drip rust on the tub’s laundry OR leave the top of the laundry load with dry/soapy and unwashed clothing because these new ones do not agitate the laundry load. I have a Bosch frontload washer and I have an issue with black mildew spots all over the plastic front panel. My gaskets are cleaned every other wash, there are no leaks, and I don’t use the dispensers (I use Tide HE pod). I do not have any smells from inside. Any suggestions on how to get this to stop and to get the spots cleaned off? I have tried mildew cleaner, but there are still shadows of the spots of the front. Thanks for any help you can email me. I always leave my door open and have never had black mould on my rubber of my Westinghouse front loader. I do often wipe the rubber dry but I don’t do that all the time. I read that different types of detergent promote mould growth. I use the cheaper brands. I have read that black mould is NOT destroyed by bleach, however hydrogen peroxide will destroy algae so that’s worth a try. Plus hydrogen peroxide is not a threat to your health, you used to be able to buy it from the chemist in a brown bottle. Hope that helps. I know this is weird, but I noticed a lot of nasty smell if I used Tide in my front loader. I stopped using it, did 2 cleaning cycles and a clean scrub of the inside, and started using a different detergent (using less than the recommended amount but clothes still come out clean). Maybe it’s a coincidence, but when I stopped using Tide I no longer have the nasty smell. I have a miele front loader since 2004 even i never opened the filter and drained it on water i did it yesterday, no smell but some blue guck (very little) from fabric softener i used until 5 years ago, did it smell ? NO. The detergent compartment had some old powder build up did it smell no(i did clean it occasionally though. Then miele is the best machine, i guess some comments are from people buying low quality brand and then give their statement. There are different qualities. With miele i never had to do rigorous cleaning. But i do wash cycles at 80c degrees when i was my bed sheets. IF clothes smell due to environmental friendly detergent i just use citric acid at 90c or baking soda or detergent with TAED. when i use citric acid or baking soda at 90c its an EMPTY machine. Just to make it clear. I also use colloidal silver to soak underwear as i dont want to wash it in more than 40 as color fades and they never become clean anyway with todays detergents. Even when my friend dog lie down on a carpet and smelled wet dog all it took was some spraying with colloidal silver and it was gone. I just tried Gene’s advice and it worked PERFECTLY!!! Thank you! So here is a recap: simply fill the ringer with paper towels and pour liquid bleach and let it soak for whatever time it takes. And you’re done, really! I tried many options and this one worked like MAGIC! thank you Gene for your help! You just made lur lives much easier. I will make sure to spread the word around. thanks again! I am cleaning my font load washer with bleach, baking soda and using affresh but after the 2nd cleaning I can still smell the mold so after the 3rd wash cleaning, if that smell is still there that means it is in the drum and you wont be able to clean it. Time for washing machine technician to take it apart for inside mold and water removal and from there on I will ALWAYS wipe down residue water and leave the door open for air drying. I have a front loading washer and have the same issue. My problem is that the machine is not working and the time that i found that out i had to pull out all my wet clothes and take the water out by hand so some water was left over underneath those little holes and so when i closed it started to give that moldy smell. So my question is how do i get rid of the smell when i cannot run the machine after cleaning the rubber with soap and a little bleach?? Anyone?? I have a Kenmore Special Edition front load washer. I bought it used and the person who sold it to me said they bought it new in 2009…so its like 6 yrs old. I also have the horrible smell and have tried EVERYTHING and cant get rid of it AND there is also black flake like particles coming out in the drain water on the wash and rinse cycles. CAN SOMEONE PLEASE TELL ME WHAT THIS COULD BE OR HAS ANYONE ELSE EXPERIENCED THIS PROBLEM? We have a used Maytag Neptune front load washer. I now know why the owners were all too eager to get rid of it. When we bought it, it looked new. The gasket had no stains on it…no sign of mold. It’s been about a year now and it is now -covered- in mold/mildew. I’ve tried everything to no avail. I have never shut the door to the machine. Always leave it slightly ajar after doing laundry thinking that was what was keeping it from getting moldy. I don’t know if I’m not trying the right product or if I’m not putting enough elbow grease into it but it’s not budging. I’m ready to go back to a top load washer. Would this cleaning option work on a washer that hasn’t been used in 4 months? After a month of not using, as I had moved, I opened the door and found that I had left clothes in there which were mouldy….yea yuck….the clothes were thrown out cuz of the stench. I left the door open and now that I am moving into a new house I need to know the best way to clean my LG front loader so that I can actually use it. I was thinking of wiping the front gasket and interior down with a vinegar and baking soda so,union and running several hot cycles with bleach. Would this be a ouch or should I try a different concoction? Any advice is greatly appreciated! Front end loaders are the worst product ever built. I have had at least 15 service calls on it, banging noise, water leaks, smell. Like the lady stated never had problems with mold in top loaders, they are all trash. Going back to top loader had twenty in my store and would just replace belts and water pumps and hoses and they ran all day and ran for 10 years. Lucky to get 4 years out of GE front loader. I purchased to cheap top loaders and had lasted twice as long. Thanks for this site! Our washer had a really mildew-y musty smell and it turned out there was ton of yucky crud in the gasket. I cleaned it out a couple days ago and ran a hot water cycle with a cup of bleach. The smell wasn’t totally gone so yesterday, I ran it again with a cup of baking soda. TERRIBLE IDEA! As of this morning, the inside of the washer smells like something died in it. It smells worse than it did before I cleaned it! Why would baking soda make the odor so much worse? I’m totally confused. I’m running another cycle with bleach only and am hoping that does the trick. Use a bleach based clinging toilet bowl cleaner and let it sit on the gasket for about an hour before running the cleaning cycle. Cleaned the mold right up on mine. Cleaning things regularly is important. If you forget to mop your floors and or get lazy, sluggishness contributes. How? Do you notice you like to walk around the house with your sweaty socks? The moisture builds up bacteria, mold, mildew, etc. When you wash your socks with the clothes, each load of laundry is distributing such build ups transferred from socks to clothes to your laundry washer too! Bleach, vinegar or baking soda is useful in this case ranging from mopping to washing laundry. funny how no one has mentioned draining out the left over water from the tube by the catch filter on the LG front loader . I empty the water out once or twice a week and it smells like sewer water . The only way that i was able to get rid of that smell is to empty the water out and do a hot wash with clorox and WhirlOut Spa, Hot Tub and Whirlpool Cleaner from Summit Brands. the water smelt so fresh i could have drank it ( i wouldnt of course ) . so now , once a week , empty the water , clorox/whirlout , hot short cycle and we are good to go again . We have had the LG WM2277HW for 9 years. It just came apart due to the classic spider drive failure due to cheap design using aluminum which I accuse the mfr of intentional to limit the life of the machine. We can’t wait to get back to an energy guzzling top loader as the time we have spent delousing this machine to keep mold at bay has cost us greatly in time (our energy) and chemicals like bleach which were discharged into the environment. Do not purchase a front loader. That is the best advice available. Hi, have read more on this problem with mold in and on front loading machines since moving to Malta and having to keep our washing machine outside. 6 months after coming here we noticed a bad smell in our clothes, we have tried everything thing to reduce this smell and nothing worked until reading this article. We now have no problem at all and this is the reason why. We do a boil wash, 95 oc every 2 months with bleach or parazone followed by a 60 oc wash with white vinegar and all is well. The mold is gone from the door seal and the smell is gone also with no damage to the washers after this is done, Thanks to all for your advice. First I want to say to Ayesha on Feb. 28th — peroxide is not a harsh chemical. Peroxide is basically oxygenated water. It is in toothpaste and I dont suggest it, but if you swallowed it, it would not hurt you. Peroxide is a natural bacteria/mold/virus fighting agent and I use it in my kitchen for counter tops, sinks and plastic ware that food may have mold in it. Peroxide is safer than bleach, mold/mildrew cleaners and some of the other chemicals listed. But, Im wondering about a lint trap, never had one in my top load machines and there is not an obvious place for a lint trap on this washer. Will look again and will contact Kenmore about this. Thank you everyone for all the suggestions. It will help keep my machine smelling nice. We have had the same problem with two front load washers. And we’ve tried all the various cleaning solutions, tablets, etc. How do you clean the small area of the front-loading washer where you slide container that you pour the detergent? It is so small and narrow you can’t get your hand in it to scrub. All front and top-load washers have a design limitation that allows water to pool in the bottom of the drum and internal drain hose. The pooling water raises the relative humidity inside the washer to levels ideal for mold to form and grow. Plus, using too much detergent per wash load and using any liquid fabric softener feeds the mold and adds to the odor problem. 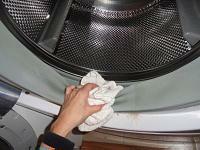 If you have a smelly machine and foul-smelling clean laundry the internal parts of your washer are teeming with mold. Could I also suggest that after you dry your seals and everything that you try using one of those shower sprays like “Shower Power” or any after-shower shower spray that prevents soap scum & mold/mildew. What dint understand is how all of these commenters never checked their seals/gaskets until they became a smelly issue. I had never owned a front loader but always wanted one since my parents got one. A year after they got their’s they got me one for Xmas. I love it! But unlike all of these commenters,I have ALWAYS kept a roll of paper towel on my washer and dried my seals after EVERY use. I have also ALWAYS removed my soap dispener after every use and let that AND the area it goes into dry for AT LEAST 24 hours. And have ALWAYS left the washer door open for AT LEAST 12 hours. Even after drying the seal with paper towel. I’ve never had an odor or mold issue at all. There are two other solutions I have not seen mentioned here. 1) Hydrogen Peroxide. Get a spray bottle and use it to spray the gaskets and thearea inside the detergent tray. Spray, wait about 30 minutes and spray again. You may have to repeat this 4 or 5 times. On the gaskets wipe with paper towels after waiting15 to 30 minutes. The foaming action produced by peroxide is very effective in removing mold. 2) After running a Clorox wash as has been suggested here, Spray the inside with 70% Isopropanol (i.e. rubbing alcohol). Place a bowl or other appropriate container containing about 8 oz. of IPA in the washer. Close door and allow 12 hours before opening door. Remove the bowl and run a cycle without a load. The fumes from the IPA will kill all mold in the washer. over 35 yrs service tech.have had this problem since the old combination machines of the 70 and 80,s. found a sidewalk cleaner called 30 second outdoor cleaner. can be purchased at home depot,fred myers,bi-mart most anywhere. have had complete success with no problems. i recommend it all the time. just add it to the detergent dispenser and run a cycle after to clear out any residue.never failed me yet. We recently moved into a house where the washing machine was full of mould. As I had 6 month old baby, I did my washing with hands for a week. After looking at the fabulous suggestions above n previous experience with mould (on the bathroom walls), I used Dettol mould n mildew remover to spray in side the rubber rim and also in the soap dispenser and left it overnight.Be careful to put extractor fan on (if in utility room )or keep the room well ventilated. Next morning I squirted thick bleach around the rubber rim n soap dispenser and cleaned it as much as possible with bottle brush. After opting a high temp. 60 degree wash. Lastly an empty cycle wash with little soap solved the problem. How do you turn light off of front loader& get to lint trap If Ileave door ajar light stays on& Ido not know how to gft to lint trap. Goodness, and I thought I am the only woman whose sheets and sweaters smell AFTER washing them!!! I had tried baking soda and vinegar and not one shade of black mold disappeared. The Bosch front load washing machine cost about $600-700 (I don’t remember, bought it 4 years ago) and I didn’t think the $150 for replacing the rubber seal was justified. I am worried that all those harsh chemicals could destroy the rubber seal itself and make holes in it, and then the problem would become even more difficult and potentially expensive to solve. Before I start using peroxide or other harsh chemicals suggested by so many of you, may I ask if anybody experienced that? Will never ever make a purchase of a front loading machine again!! I have been blamed for leaving clothes sit too long in the machine and that is why they stink. NOT TRUE. I remove them as soon as the machine is finished and the stench is horrific! I cannot believe that manufacturers are allowed to sell this product that collects so much unseen mold! Wish I could go back and stick with the top load machines. Thought they were a great idea. Frigidaire made a horrible product! We’ve had our frontload machine 5 years and I’ve never had these issues! From the start I followed the manufacturer’s maintenance suggestions. I also am able to leave the door open after every load and I do not use fabric softener (drier sheets are my choice). Good luck everyone! Cycle 1 : using a supermarket drain cleaner (caustic soda / sodium hydroxide would also work). This is very good are removing the greasy/fatty building ups that cause the stink problem. Some of the liquid cleaners may cause a foam problem. In a little container I mixed hot water, bleach and a tad bit of white vinegar. Grabbed a tooth brush and scrubbed the outside of the gasket. For the inside of the gasket I soaked paper towels in the mixture stated above and stuffed them all the way around inside the gasket. Let it sit for about 30 minutes and then wipe it out. It almost looks brand new now. Also removed the dispenser and there was a lot of mildew behind it. Grabbed the tooth brush again and reached back there…came off easily. Next I will run the cleaning cycle on the machine with bleach and it will be finished. After all this hard work I think I’ll be motivated to do preventative maintenance such as – wiping the gaskets/door after washing and running a bleach cycle once a month. I was given a second hand Electrolux Front Loader Washing Machine tonight as a gift. I noticed that it has mould on the rubber, so will try some of the suggestions. My own washing machine isn’t very old but it is smaller so I won’t say no to this one, but hope I can remove the mould. Thank you for the great ideas I have found. At least there is some hope. 2 dishwasher pellets like cascade complete, 1 liter of bleach, hot hot hot water. let sit overnight and smell was gone after rinse, I must say I have used beauty shop 10% peroxide like used to bleach hair on items to remove discoloration. Wonder if it would work on the rubber seals on washer? I have not tried this remedy. Cami is absolute right. I have the same LG machine with the same problem. This problem is not a simple problem but a health problem. How is possible that this designs of washing machine are not be recall? I am 68 years old and since I remember we have washing machine in my house and NEVER before we have this fungus, mold problem in the door gasket. Why the manufacturer are not responsible for this BAD design. Thanks HAVE A BEAUTIFUL YEAR. LG has a large gasket, inside and behind the inner flap is another smaller gasket against the drum. it has 3 rectangle holes drains? all filled with thick mold. no amount of prying and scraping crud will reach these areas. the mold on inner flap goes all the way around. cleaning large flap inside gasket no easier either. no solution will reach these areas when cleaning with various solutions. remedy? remove door,front and gaskets to clean..HOW It seems from what I have read, no one else has bothered to actually get in there to see if they have this same issue of multiple gasket and thick crud and clogged drains this can’t just be a variation F can it?? Instead of using paper towels folded and ripped into strips to put in the gasket, go to the local beauty supply store and buy the roll of cotton they use for doing perms-like a cotton ball n steroids. I use that soaked in peroxide for the caulking around the tub every few months to help combat mold there would work just as good in the gasket for the washing machine. I gave up, tried everything but my clothes still were stained at the end of every wash. The difference was the staining came from the drum and not the gasket. I just bought a top end loader. End of story! there is one company out there and is the only one i found that doesn’t have this problem,because it’s water sealing system is different,just a little bleack strip,like the ones in the laundry mat. i got a 10 kg front loader and it doesn’t have this problem,check it out on their website,another thing is the strip is black in color,so not as noticeable,product has a 15 year life too,but like with every front loader,i just change the rubber seal every 2 years,it’s like with material thing there is,it needs maintenence and reapirs at times to keep running smoothly.this machine is an asko. I can’t thank you all enough for your helpful comments and suggestions. For those doubters, they DO work!! I have a front load washer that had accumulated a good deal of mold and gunk. The baking soda solution did not work for me but I had a lot of success with the bleach, white vinegar and hydrogen peroxide suggestions. The one change I did make was to take an entire sheet of paper towel and fold it repeatedly. Outcome was a one inch, multi-layered strip. I soaked this in bleach, then layed it inside the rubber seal. The added thickness meant it touched both sides of the seal. I plan to continue this regimen on a monthly basis to keep my machine clean and clothes smelling fresh. Had washer for 3 years. Tried washer cleaners, vinegar, lots of bleach- nothing helped. Started using tide powder for HE, no liquid laundry softener. After 1 week- PROBLEM SOLVED!!!! So excited!!! I was ready to buy a new washer! Just wanted to let some people know that the smell does come from mold but it also comes from using too much HE detergent. The amount that the label tells you is too much. You only need about A tablespoon. I recently learned this when my technician came to fix my machine. I tried it and have not had the issue of smelly clothes. I always keep my door open after washing for a bit and dry the gasket per booklet instruction to keep mold away so I have not experienced the mold issue the last 2 years of owning my LG. We have had front load washers for over fifteen years, and have fought with the mold in the door gasket continuously. Nothing seems to work yet, but we haven’t tried peroxide, that’s next. One of the problems with front loaders is the location and function of the drain pump. This is located under the tub for the obvious reasons. As the pump moves the drain water into the drain tube, a check valve blocks the water from coming back into the pump sump. However, the pump and sump design allows some water to remain in the sump, and unless the filter is removed and the sump drained after every use, this water will “sour”, causing most of the unpleasant odor associated with a front loader. If you doubt this, remove the drain filter without something to catch the drain water. Leaving the door open between uses “should” allow this water to evaporate, but it is still necessary to wipe out the gasket channel to minimize mold. I keep hoping some manufacturer will develop a means of evacuating all of the water from the pump and filter housings, but nothing has shown up yet. It should be noted that the pressure (weight) of the drain water in the drain tube keeps the check valve closed when the pump is not pumping. If this valve does not seat or leaks, the water in the drain tube will drain back into the pump/filter sump, and the odors will get a whole lot worse. It should also be mentioned that before using any liquid that is not a common laundry item on your washer it is advisable to check with the manufacturer as to the compatibility of the cleaner with the door gasket material. For instance it is not advisable to use vinegar on some silicon rubber products. Just a word of caution. I have a front end loaded and lately we noticed the clothes are coming out stained, looks like dirt or mud. my last load of towels came out stained where it was sucked up against the drum in the shape of little dots. I’m guessing the problem is inside the drum. Has anyone else had this problem or know how to deal with it. Black glug all through and behind attached rubber seals of my Bosche front loader washing machine. I am elderly (really OLD) and am a little desperate because my husband has noticed the glug. Doesn’t seem to have an offensive odor. I use”Dynamo” front loader detergent at only 30*c because of no really soiled clothes. I have tried various suggestions to no avail. Do I buy a new washer and perhaps be more fussy with drying/airing etc? 10 minutes – gone! I had success removing mould/yukky scum + smell, (after initial wipeover with baking soda or vinegar)with my front loader using strong bleach and gel product (uses sodium hypochlorite 52.5g per Litre, includes sodium hydroxide 12g/L) .It is tho an Aussie product, White King PowerClean bathroom gel, supposed to expel into crevices but is runny, need gloves. Left for 10 mins, rinsed.Was surprised to read here that bleach was successfully used soaked in strips around the rubber gasket, it was useful, thanks!- this is my alternative. Hope not to use the product very often, for environmental reasons, but baking soda etc just doesn’t work for me!. My Bosch front loader had quite a lot of mould on the rubber door seal. The manufacturer said to make a paste of baking soda, this didn’t make the slightest difference. They also sent me a sachet of Scalex – no change either. So I used Exit Mould, which I think must contain hydrogen peroxide rather than bleach. I packed all the areas of the seal with thin rags, and soaked them in Exit Mould. Left for a few hours and mould virtually all gone. Will now dry the seal between washes, hopefully won’t return. Gene’s July comment to Rita just made my night. Thanks for the suggestions everyone. I’ll definitely be trying Hydrogen Peroxide and cleaning every bit of the gasket and dispenser that I can with the other suggestions. I have a 6 year old LG front load washer. I noticed a really foul smell when I washed clothes, the mold on the gasket was out of control. I never had a problem until I started using liquid fabric softener. Lesson learned, thanks for the many tips on cleaning. This job will take at least 2 days and many wash cycles to clean up. What a mess!! My LG front loader smells terrible. I have check it everywhere but there is not visible mold. There was a little bit collected in the detergent dispenser but I cleaned it. The gasket was also fairly clean. Also cleaned it with Clorox wipes. Where can the smell be coming from? Is there some other part I can open or check? Have Maytag front loader just discovered its nasty gasket secret. What a mess! Wondering if anyone has tried steam cleaning. We wiped off as much as we could but need a way to sanitize and dry up this issue permanently! After each and every use of my washer, I wipe the door gasket completely dry with thick absorbent face towels that I leave right near the machine for this use only. I wipe down any moisture I see on the door as well. Then I leave the door open to dry whatever I missed or couldn’t see. I wash the towels frequently. It’s just part of having an energy and water efficient machine, so I don’t mind. But it would be nice if a designer sorted this moisture issue out as I know most people don’t, or can’t, do this kind of routine maintenance. Thanks for all the info, for the washer.. I also have a lint catcher on the washer one time couldn’t figure out why my washer wasn’t draining. I opened it up the lint trap n I had water all over the floor. We have 2 dogs 1 is a lab and when I wash the couch n chair covers it filled up the lint trap so now I check it 1-2 months. Before you blame manufacturers, here’s a bunch of facts/suggestions/questions to ask that might help you figure out your problem. 1. Is anybody in your house verifiably allergic to mould? If so, what kind of mould? Is it the same kind as you see in your house (usually there is more than one kind in the same place). 2. Allergies are tricky. Even though the mechanisms of immune reactions involved are reasonably well understood, usually there is a significant neurological component on top of that, which is mysterious and hard to control. For example, I am allergic to pollen; this type of allergy is seasonal and I only experience significant symptoms during a couple months each year. But I can also have a full-blown allergic reaction in winter, caused simply by viewing a convincing image of the weeds to whose pollen I am allergic. The symptoms are real, while the cause certainly is not. If you do have any elevated response to mould at home (compared to other environments), try to think of them as your friends, or at least as a curious subject of study, and see if that new mindset changes your response. Just the knowledge of the possibility of psychosomatic reactions may be enough to reduce their occurrence and impacts. 3. Allergies are irritating, but seldom hazardous. Mould can be hazardous, although rarely, and even more rarely, the hazard will have anything to do with allergies or asthma. There are toxic or parasitic species of mould. In any case, it helps to know exactly what you’ve got and how it affects you, if it does. You can’t worry about everything. 4. The mould of any kind requires two conditions for growth: an organic substrate and a 100% humidity. While you can’t eliminate the former, the latter is relatively easy to control. If you find mould everywhere in your house, it means you have problems with insulation, ventilation, or both. If the problem becomes worse in winter, there is hope that you can eliminate it by fixing insulation and ventilation and by properly heating your house. If it persists year-round, and your environment is likewise persistently humid, you may need a dehumidifier in every room, as well as a tight control of all sources of humidity (shower in a closed cabin with an extractor fan, boil your water under an extractor hood — not the phoney filter hood that is more common). 5. Even in a dry house, there are always places with high humidity. Your washing machine is one such place, especially if you keep its door shut. It is not possible to evacuate all water from a washing machine without disassembling it. It will always have at least half-a-litre in it. The door gasket is one first things to get infested with mould because (1) it is made of a digestible organic material, and (2) liquid water gets trapped in its folds when you shut the door. 6. Three months is not a long time. Generation time for most species of mould is several hours; some can double in less than an hour. Under favourable conditions, it only takes a few days for them to grow to a maximum density. 7. Don’t try to “save energy” by doing cold wash. You are likely to spend more fixing problems resulting from doing so. Use the highest temperature that the fabric allows. 8. It is possible to control mould with anti-fungal chemicals and oxidisers, but that is often like swimming upstream. Controlling the sources of moisture is an easier long-term solution. 9. (a bonus item) Remember your troubles with mould when you hear people preach doom and rave about life being in a “delicate balance”, prone to destruction by one made-up hazard or another. Mould demonstrates that life is practically indestructible. I too have found black mold on the rubber seals of my front loading washer. This is most distressing. I recently (3 months ago) moved to a new location, close to a lake and the ocean. Mold is a terrible problem in this area. I am removing water from my shower, immediately, and repeatedly after each shower. I am hand drying all my dishes, immediately. I had left a towel under my dishes, on a wooden cutting board for a week or two, and it was covered with black mold, so I immediately threw them out, and I hand dry all dishes, pots and pans, etc. thoroughly. However, I had no idea that black mold could grow on rubber gaskets in the washing machine! I think the manufacturers bear much more responsibility for warning customers of this possibility, and making recommendations! My machine is only 3 months old, and I am very, very upset. All in my family have allergies, and asthma, and this is very disturbing and disconcerting. I’m angry and sad, and I hope we’ll be able to manage the problem, soon. Thanks to everyone for their suggestions, but there is such a far range of possibilities, it’s hard to know which to try. I’ll probably try all of them. I have a 7 year old Tromm front loader. Recently noticed the bad mold smell even after doing the tub clean. Researched the internet and found a great post where the appliance repairman suggested unscrewing the roller bars inside the drum and sliding them off. So, I used a phillips screwdriver and loosened the bar and removed them. What I found was both pieces coated with black, smelly gunk! I had to use my hand-held steamer on the attached bars and scrubbed the part of the bar that came off. I reattached them all, did a tub clean with cascade, and it has been a week and no smell! I have before and after pics but cannot figure out how to post them. How do you clean the second drum under the visible drum after there has been mold in the washer? I had a really bad smell from our front loader. We washed our sheets the other day and they smelt so bad we couldn’t put them back on the bed!! We rewashed the sheets last night using the last bit of white vinegar we had in the bleach and liquid fabric softener dispensers along with detergent in the soap tray. We have fresh smelling sheets again…I’m off to the store this morning to buy more vinegar and I will run a wash cycle just on hot and fill vinegar in the bleach and softener trays with no laundry just to neutralize anything that is left. From now on, each load will have vinegar…its cheaper than fabric softener but softens the clothes just as well and also keeps the machine smelling clean. For David with the green leafy matter in his washer: unscrew the filters in your faucets and see if you have matter in the screening. We have a well and had a problem with the filter on the washing machine clogging with dark matter. The well man said it was tree roots getting into the well and he had to blow out and empty our well and wait a few hours and then the water was fine. Roots from a long ago cut-down Elm tree worked their way into the well. This just might be your problem also. what works for me is: a cup of vinegar and a handful of rock salt and wash at hottest temperature. Rinse and dry. it cleans out the pipes and everything of the soapy stuff, next cycle i use pool shock cleaner and voila! I have a top loader washer that periodically has greenish leaf like debris in the washer. The washer appears to be on a properly installed drain system. We do use well water. Of course we are not putting clothes in the washer that have leaves, grass, etc. on the clothing before the wash cycle begins. Any ideas as to what might cause this greenish leave like debris and what help eliminate this problem. Louise, your advice sounds like shooting in the dark, making your successful outcome quite remarkable. Just the bleach or the bicarbonate of soda would have helped if you used either of them separately. By mixing them arbitrarily, you have simply wasted a significant amount of one or the other. Vinegar probably didn’t do anything (it can suppress growth during the time the mould is exposed to it, but it does not kill. And your blanket had no effect at all because it was confined to the drum. The mould grows on plastic and rubber surfaces outside the drum. Brent: Following manufacturers’ instructions will certainly help a lot of people, but there is no guarantee. Your outcome will depend on your environment as much or maybe more than on the procedure you use. I did not have any problems with any washing machine I happened to use for 30+ years (except for heating elements burning through in hard water) until one day I found mould clogging the pressure sensor tube in a new machine, causing the tank to overfill. I cleaned that tube and its fitting, but some weeks later it was fouled up and overfilling again. There was no trace of mould anywhere else in that machine. It was just that particular species of mould preferentially colonising that particular tube. The problem was resolved by putting in the tube made of a different material and with a wider i.d. A lot of our experience is not portable and there are no universally helpful instructions. The best portable advice is adapt as you go. I tried every comment on this website and the only thing that worked is the peroxide. I had black mold all over the rubber on the front loading door. Nothing took away the stain except straight peroxide. It is now completely gone. I put peroxide in the rubber well every time I do a load of white clothes so if it gets on the white clothes it won’t hurt them. Don’t get on colored clothes it will bleach them white. I also use on mildew in shower. it works great there too and it is so cheap to buy. This is a great website. Thank you. Best way to prevent mold is to follow manufacturers instructions to the T. Dry the seal after each load, keep the door slightly ajar after washing, only use HE detergent, never overfill the detergent line. I’ve had my LG frontloader for 4 years and never had mold or smell problems. Many people dont realize that the suds from regular detergent fill up inside the seal which in turn causes soap residue and then mold. Using low suds HE detergent in recommended amounts is a MUST. Thanks for the tips dealing with mold and mildew in a front-load washer and cleaning a shower! I struggled to get rid of mold in my 12 year old Bosch front loader. I realized that the water is at a low level but the mold is at the higher level. I decided to forfeit a single blanket, stuffed it into my machine, added a cup of each: white vinegar, bicarbonate of soda and bleach. As I realized that there must surely be a build up of soaps and softness, I added half a scoop of washing powder. I used the 90 degree C cycle. I had soap suds pouring out through the soap dispenser, but I cleaned up as it came out. The poor blanket was ruined, but the machine smelt fresh. Since then when I do a load of towels and whites, I add a cup of vinegar and half a cup of bicarbonate of soda, no more smelly clothes. As for the gasket, keep is DRY, leave the door open and REMOVE the soap dispenser completely after the washing is done. Never leave the wet washing in the machine, it will stink the next day. Darkness and moisture also plays a major role I believe in mold. My husband cleans our shower with Epsom salts mixed with a good quality dish washing liquid, using a pot scourer that comes with the sponge on the other side, we never have any mold and the shower cleans up beautifully in no time at all. The best we ever used. I too have had my LG front loader for almost 5 years and now have black mold on the rubber gasket. I was hospitalized for a week and a friend forgot to take out a loss of delicates so I came home and opened the door to a nightmare! Brand new clothes that smelled up the whole house. I’m still in the prices of trying to clean up the mess 3 days later. I live in West Texas where the temps reached high 90’s the whole week the washer sat. I immediately ran the clean cycle twice with bleach but the gasket remains a problem. I’m going tho try the paper towels in strips with hydrogen peroxide or borax (I already tried bleach). And I’m going tho soak the delicates in vinegar and then wash with some of the ideas posted. Thank you all for helping me save about $300 worth of clothes. Pipe cleaners? A little fuzzy and bendable. If you could get longer ones would be good. Hi, I have just been cleaning the washing machine and realised the mould has built up inside the pipe of the dispenser (where the detergent goes through)I have run the self tub clean function using a washing machine cleaner twice(Dr beckmann service – it) but the mould is still there and I am having difficulty reaching the area with a cloth, so I have tried scrubbing it with a toothbrush! How on earth do you clean the inside of the pipe without tearing the machine apart! If you can kindly suggest anything that I can do, is it worth calling someone out for a machine service? Thanks in advanced. I was told by an expert in bio hazard abatement that bleach doesn’t kill mould. It’s a myth that it does. It will kill some of it but it mainly bleaches it. It will become visible again. He said his company uses hydrogen peroxide to kill mould. I have used it in my shower with great success. After reading many of the woes others have with their front loading washers, I think I’ll try cleaning with hydrogen peroxide and running a few cleaning cycles with it as well. I just took the dispenser drawer out from my GE front loader and the whole inside of the washer was covered in black mold. We’ve been getting very itchy lately and tried changing detergents. I’m wondering if it’s the mold that is getting into my clothes! Very upset about this. I BELIEVE MY WATER LINES OR SOMEWHERE IN WASHER IS CLOGGED WITH MUD, FROM A WASHLOAD THAT WAS QUITE MUDDY. NOW WASHER WILL NOT FILL WITH WATER NOR WILL IT DRAIN THE WATER THAT IS IN THE WASHER? HOW DO I FIX THIS PROBLEM? THANKS FOR ANY HELP WHATSOEVER………. I appreciate this info. My family had accused me of letting the clothes sit too long in my front-loading Amana washer because they had such a fowl odor. Now, I understand it was a mold problem. But to address the problem before I read this info today, I started using approximately 11/4 cup of baking soda and 11/2 cups of white vinegar with my detergent in each load. Now, the clothes FRESH. I am running a 75-minute hot water cycle with bleach right now, though, because I may still have a mold problem and not know it. Maybe this will help you, too. I have been cleaning my seal for several hours now trying to get a hold on this nasty stuff , still no luck I even took my seal off and let soak in bleach and scrubed with stiff brissel brush and still no luck, I think that all the distributors of these pieces of —– should be held liable and be forced to inform all future buyers of these problems. I have a 5 year old Bosch Nexct 300 Series front loading washer. I have followed all directions since I bought it. I tried every cleaner I could find in grocery and department stores. The mold in the rubber remains and at times smells. Bosch gave me suggestions too but no luck. Am allergic to mold and can’t afford replacing the mschine. Hi I have this exact model washing machine in the picture but my spin cycle isn’t working. I am trying to find the exact model number so I can get someone to fix it. Can you please tell me what model that is in the picture so I can try to get service for the washer? Also-thanks so much for the tips on cleaning because since I haven’t been using it there is def mold present. Thanks for sharing your cleaning method for moldy washers! I just bought a used Tromm from my sister. It was caked with mildew on the inner wall of the rubber gasket. The gasket has a large outer vestibule and a very tight inner one. I used hot water, dawn, bleach and a rough towel plus an old toothbrush to get 3 years of build up off of it. It took two cleanings with 24 hours and an open door between cleanings to get most of the gunk off. I also had to pull out the detergent compartment and scrub the inside that it slides into. It needs small hands. I was surprised that there was mold there also. I finished off with a hot water bleach cycle. Let it dry over night (door open) and then did a cascade wash. The smell is lingering, but I’ll probably continue to do empty cleaning cycles once a week until it’s normal again. Here’s how I do it. Tear a paper towel into several strips 2-3 inches wide. Pad all cavities in the gasket with those paper strips. Set a few strips aside, long enough, in total, to cover the straight cylindrical section of the gasket (where you see most of the mould). Put your latex gloves on (I do it with bare hands, but I am thick-skinned) and soak the paper in liquid bleach. The best kind to use is the gel bleach (known as “thick bleach” here in England). Then paste the strips onto the gasket and run your finger over them gently, chasing the bubbles out. Make sure the affected area is completely covered. Then squeeze the bleach out of the bottle onto the wadding you stuffed into the cavities earlier, spread it and massage it in, making sure the paper is completely soaked with no bubbles underneath. You may want to shut the door and leave it for several hours to a day. Be careful not to displace the wadding when shutting the door; if that proves difficult, leave it open, but then make sure there is enough ventilation in room during the first couple hours, when the bleach is most active. When you think it’s done (or when you’ve lost patience), collect the wadding in a plastic bag and dispose of it along with your regular, non-recyclable waste. Make sure no paper is left in the gasket or falls behind the drum. Most paper towels will turn into a soft pulp by the end of this procedure, but some are tough enough to withstand it and may clog important orifices in your washing machine (although that is very unlikely, better be careful). How do you get black mould off the rubber gasket around the door of my front loading LG washer without using bleach or harsh chemicals. When I called about replacing the rubber around the door, I was told it would be $150. My machine is only 3 years old and I don’t want to spend that kind of money on it.